For over 30 years it sat in a drawer in John McCosh’s Kahutara Taxidermy Museum in South Wairarapa, its identity not known and unvalued. 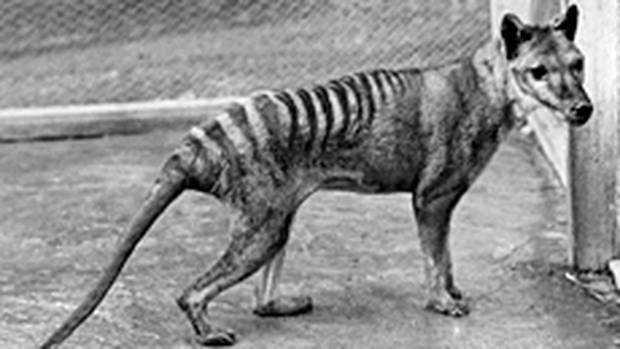 About a year ago a visiting group of students from Victoria University and a Te Papa curator of vertebrates Alan Tennyson recognised it as the distinctly striped skin of a Thylacine, better known as the Tasmanian tiger and long thought extinct. Tennyson quickly recognised the thylacine skin and its significance. The thylacine, also known as the Tasmanian tiger or Tasmanian wolf, was a carnivorous marsupial with a striped back and a coughing bark. They are classified as extinct, with the last known animal dying in Hobart Zoo in 1936, but there have been repeated claims of sightings, none of them confirmed. Tennyson contacted Dr Stephen Sleightholme, based in the United Kingdom, who is project director of the International Thylacine Specimen Database. There is significant scientific interest in the thylacine and the ITSD is a comprehensive study of all specimens that are known to remain. In recent years scientists have sequenced the thylacine genome and now believe they may be able to clone the Tasmanian tiger, bringing it back from extinction. McCosh said he was blown away when he found out what he’d been sitting on for over three decades. The skins were brought to the Kahutara log cabin museum on permanent loan from the surviving daughter of Whanganui collector, Archie Robertson, who acquired the skin in 1923. His daughter, Janet Withers, lent the skin along with his collection of stuffed birds to McCosh after Robertson passed away. McCosh said he didn’t know what he was getting when Withers lent it to him, and he thought it was just another skin. The skin is one of only 78 remaining in the world and is said to be in great condition. The Kahutara museum is dark which helps maintain an even temperature and prevents the skins from deteriorating. There’s some hope that DNA can be extracted from the skin and potentially used to bring the species back to life one day. “They never had a skin as good until [this one] showed up. It shows that I did a good job of looking after it for the last 30 years. 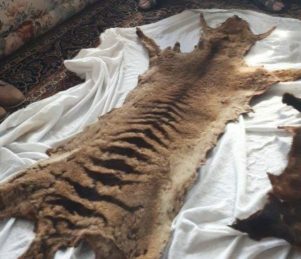 The skin was returned to Withers before being sold to the National Museum of Australia in December for over $200,000. “It’s like an artist when they die and their paintings double in price,” McCosh said. Though he’s got a few moa bones in his collection, he’s confident he’s not sitting on any other discoveries – no dodo birds or mammoths tucked away. 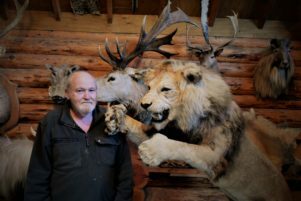 Every piece in his 600-strong collection of stuffed exotic animals is interesting to him though and the log cabin also boasts a green-eyed leopard, a vast array of antelope and other large game bucks, and a small pride of lounging lions.